Game Play – The game begins with selecting a starting player, then players take turns placing their chickens in the 4 different political houses, which are Aedile, Praetor, Censor, and Consul–and of course the office of Caesar. 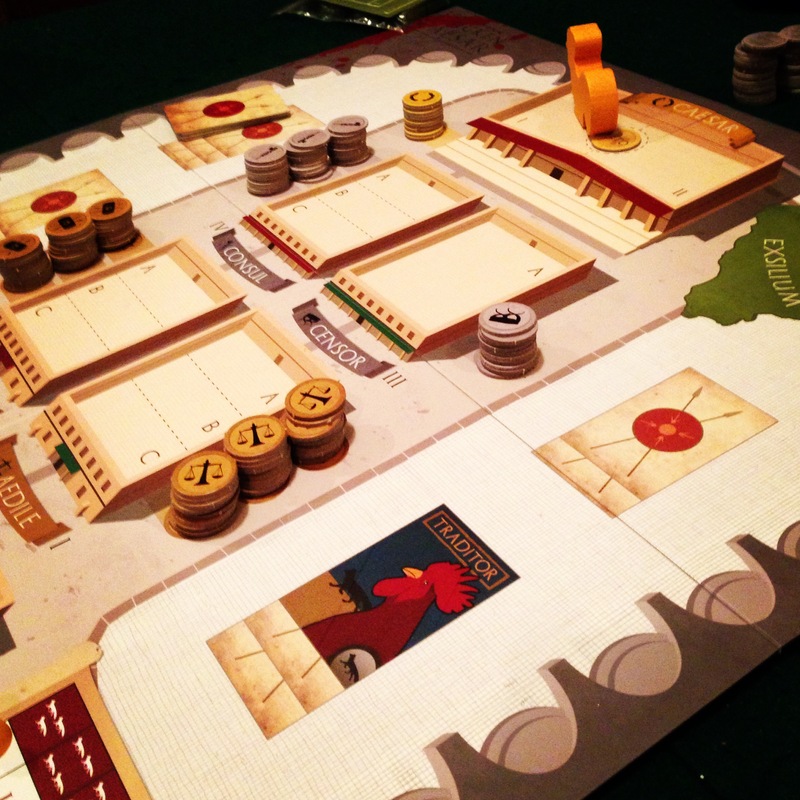 The game goes through several phases, in which players (after turn 1) advance into vacated office seats, perform their office actions (changing tax rates, assigning guard chickens, choosing to exile a chicken from office, or overseeing the improvement of monuments), gain the rewards of their office (sometimes money, but always an office token to place on their chicken’s corresponding card), and then resolve attacks from the foxes who will more than likely take a chicken off for dinner. 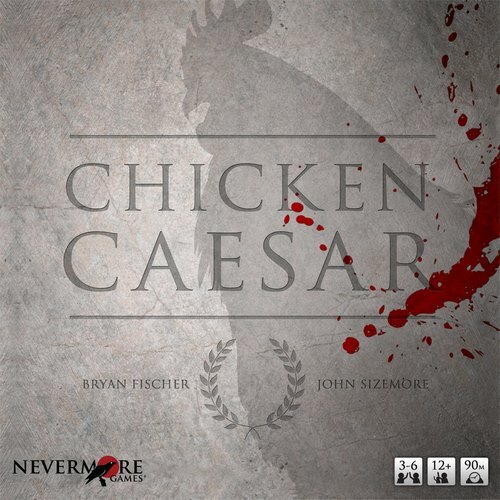 And finally, Caesar usually dies, and players make suggestions to improve their dead chickens’ monuments. The main scoring engine is to either gain tokens from many different offices, which are cashed in at the end of the game, or to earn a ton of cash during the game. Frumenti is then totaled and whoever has the most wins. I think I like this game. It is about what I thought it would be. Obviously I’ve only had one go at it, and the learning curve is pretty steep, but I’ll offer my comments thus far, and would love to hear your thoughts as well. Components – The quality of the components are great, I felt from an artistic standpoint there is a touch of an identity crisis. The art design and imagery is great, and of high quality, but the only thing that makes it “Chicken” Caesar is the fact that the cards have chickens on them, and the tiny little foxes above the tax rate indicator on the board. Otherwise the board is set in ancient Rome, with pristine alcoves for monuments of the deceased, and a swank palace for Caesar. It looks great, but it doesn’t look Chicken-ee enough in my opinion. It’s quite the juxtaposition. The Game Play – The crux of the game play is player interaction; if you’re simply moving your pawns around the board, you’re missing out. We played with four players, and we had fun with trying to barter, beg, or bribe our way into better positions, but I can see the game thrive with 5-6 players and give more chances for sub-plots to take place. Likes and Dislikes – I like the spirit/idea of the game, I love games that are highly interactive and are driven by trying to outsmart the people at the table instead of trying to outwit the game (unless of course it’s a co-op). I like the theme; it’s what first attracted me to the game, to be honest. It seemed ridiculous, in a good way, but I don’t know that the players experience the “barnyard” in barnyard politics. My biggest dislike is the rule book; it’s dense, and the designers know it, and admit it, so this isn’t news to them or anyone. But it really created a hurdle for us as we played through the game. If there was a quick question we needed clarification on, it often felt like we had to read a full-out thesis on the issue at hand before we got the answer we were looking for. For many, this would be a game killer. I’m hoping to power through this and get a better grasp of the rules so when we play a second time we can get through it more smoothly. But it can hinder a player’s ability to make an informed or well-thought-out decision if they are unaware of the process that comes next. Overall – Like I said, overall I think I like this one. It needs a few more plays for me, but there is a fun game on the other side of that rule book, one that hits a lot of sweet spots for me. Stay tuned for more thoughts and my finalized review soon! Thanks for reading; we hope you’ll find us on the interwebs at Facebook, Twitter, Instagram, and YouTube, and we invite you to tune into our Podcast every month as well! Any idea where I can find the game Jamaica online without having to spend a fortune for it? Looks like all the major stores are out of it. There isn’t even a US copy to be found on the Geek.